Frequently Asked Questions for Paul Yandell C.G.P. How do I order Paul's CDs? 1975, and served as Chet's sideman in his career that lasted for 25 years. The two men were also close friends. The Today Show, The Pat Sajak Show, The Merv Griffin Show and Nashville Now. How did the C.G.P. Award Come About? Started with Chet in…? How Many C.G.P. Awards were Given out? How did Paul get hired by Chet? What Strings Did Chet Use? What was Paul’s early recording setup? What Microphones did Chet use? What was playing on The Opry at the Ryman like? What Kind Of Echo Did Chet Use? Who was Odell Martin? The Nashville Classic What was the “Peaver”? Why did Chet leave Gretsch? What was Life on the road like? Gibson Country Gentleman What kind of picks did Chet use? Reversing Bridge Pickup on Gibson Country Gents Did Chet play single lead lines with thumbpick or fingers? The DelVecchio Most unusual re-tuning Chet used? What is an “Octobass”? What is “Bridge Pinning”? How high was Chet’s action? Did Chet take special precautions for his guitars while traveling? Have There Been Any Major Changes In The Nashville Classic? Did Chet Get Nervous? What Happened To Chet’s Guitar Collection? Where Can I Find Tabs Of Chet's Songs? What's the zero fret on the Country Gent all about? Where Can I Buy Chet's Books And Records? Did Chet Have A Favorite Steel String Electric Guitar? Are Any Biographies Of Chet Available? And What Is MAMG? What Are Those Two Holes In The Top Of Chet’s ’59? What Amplifier Is Paul Currently Using? Does Paul Have Any General Views About Playing? There's A 12-string Country Gentleman On The Cover Of Chet Atkins Picks On the Beatles. Did Chet Actually Use This On Any Recordings? That Handle On The NC Is Not Quite Where I Need It To Be. What's The Recommended Way To Bend It? How Long Was Chet An A/R man for RCA in Nashville?/What Does An A/R Man Do? Why isn’t the Nashville Classic Called A Country Gentleman What's with all those tuning forks and pop-up mutes and such on the Chet Atkins models that Gretsch used to make? The “Frequently Asked Questions For Paul Yandell" page contains answers to some of the most often asked questions about Chet Atkins, his life and times and most of all his gear as answered on the Chetboard and the pioneer ‘Fretboard” posting boards by Paul Yandell himself. All of the answers are based on his posts that were gathered and combined from the original sources for several years by “The Norm” and archived in the style you see here. In some areas the offerings are a combination of responses about a given topic that are “blended” for continuity’s sake. Some of the sections are lightly based on articles and book excerpts but this was kept to a minimum and Paul’s own words were used as much as possible. Paul’s words are in italics. How did the C.G.P. Award Come About? Chet had given me an obelisk of marble or jade he’d had sitting around in his office. We took that to Mark Pritcher and he had it engraved. Chet gave it to Jerry at the CAAS. A few years later I think Mark Pritcher got the idea to give one to John Knowles and he talked it over with Chet and they gave it to him. After Chet did that CD with Tommy Emmanuel and we all saw what a great player he was I suggested to Chet that they give one to Tommy which they did. People ask me about it but nobody suggested about giving one to me. I always thought that, because it was my idea, that it would be in bad taste and self-serving for me to get one. I don't care for awards. I got the best award of all I got to work for Chet for 24 years. How Many C.G.P. Awards were Given out? Chet gave out only four CGP's, Jerry Reed, Steve Wariner, John Knowles and Tommy Emmanuel, there are two or three people who claim Chet gave them one but that's bogus there were and are only four. Sometimes people talk about ‘carrying on the CGP awards’ but Chet's wife Leona told me she didn't want anymore CGP awards given out because that whole CGP concept was something that Chet had done and it was his award to give and no one else’s. He gave four CGP's to four of his friends. Had he lived I'm sure there would have been more. (In August of 2011 Paul Yandell was named the 5th and final CGP by the family of Chet Atkins during a ceremony at the Chet Atkins exhibit at the Country Music Hall of Fame – Tom Redmond). What Strings Did Chet Use? He used different gauges but I know sometimes when he recorded he used a wound third. Leona, his wife, gave me all of Chet's strings and it was a bunch friends and most of then were Gretsch strings of different gauges so I'm pretty sure he used Gretsch strings. Chet, in an interview with Guitar Player in Oct '79, said at one time he was using Gretsch "Chet Atkins Country Style Strings". (#672) He gave the gauges as .010, .012, .020 wound, .028, .038, .048 or .050. On his “Octabass” guitars he used D'Addario XL-170S short scale bass strings using the third for the guitar fifth which is an .080 and the bass forth for the guitar’s sixth which is a .100. Chet changed strings when they had been on for a while. He was always afraid the first or second would break during a show. For nylon strings Chet and I both used D'Addario Pro-Art, although both of us at times have used LaBella 500p Professional concert & recording strings. He used Silk and Steel strings on his DelVecchio. Chet used to changed his strings on his nylon string guitars pretty often, It seemed like he changed them before we would go out to play a date. If left on too long I think the bass strings become dull in tone and sometime the first and second will start noting flat. Did Chet Ever Use Flatwounds? Chet didn't like flatwounds. He said they are dead as a doornail…no sustain. He hated the sound those jazz players got and they used flatwounds. Chet once said that Johnny Smith was the greatest musician he had ever met. Johnny got a better tone than most of the jazz guys who, for the most part, sound like they had a quilt over their amp. Did Chet have favorite Amps? For most of his recording he used his 1954 Standel miked with an RCA 44 ribbon mic. It had a JBL D-130. It was only 25 watts but Paul said it was a loud 25 watts. Chet's Standel was made in 1954 and was made for Jimmy Day a steel player. Chet traded him a Fender Pro for it. It is stock… still the same original. JBL 15 inch speaker in it. He has used this amp on 98% of his records both for his electric and electric nylon string guitars. Chet's Standel has a great sound. It sounded better than the ones I had. The Standel amp isn't very durable for road work. The way it’s made the power supply is in the bottom and the pre-amp in the top. If the airlines can destroy a suitcase, think what they could do to an old amp like that! When a person has an old piece of equipment you have to give it special care, Chet's amp has served him well all these years and is still going strong. During Paul’s tenure they both used Fender Deluxe and Fender Princetons modified by Paul Rivera. Rivera also provided modified 50 watt Pignose amps and Peavey amps were occasionally used. Finally Chet and Paul settled on MusicMan RD-50 which he really liked. It miked his classics well. He preferred the stock speaker. Chet used that model until he retired from the road. Chet did not care for the high output amps like Fender Twin Reverbs. I used a Music Man RD-112, 50 watts. Chet used them too. It was the road amp we used the last 10 years or so. Chet never recorded with those but he like them on the road. He said it was the only amp he had played where the nylon guitars sounded good. For an electric steel string (Country Gentleman) a 15 inch speaker sounds better as it has a much bigger sound than a 12 inch speaker. Music Man put two different speakers in those, a stock speaker and an Electro Voice, which is a heavier one. It's rated at 200 watts. Chet liked the stock one the best. I used to buy those amps when I would see one in a music store so I've had maybe five or six of them over the years. They really sound good with Groove Tubes in them. Since I don't perform much anymore I sold my MusicMan RD 1-12. I now have a Peavey Delta Blues with one 15" speaker. I put a JBL D-130 in it. With a 15" you get a much bigger, fuller sound. It is really a good sounding amp and it doesn't cost very much as amps go now days. For a while we used Peavey Special 130 amps but we didn’t use them for very long. They had a thick heavy tone that we didn't care for and Chet didn't like the way his nylon sounded through them. We started using them because we tried to rent amps for a while in the cities that we were playing instead of carrying them on the planes but after a while we stopped doing that. Chet and I played our amps pretty loud, louder than I would if we were sitting and playing at home. We‘d set the amp mike about 12 inches away, pointed a little to the side, not at the center because you get a lot of highs if you point the mike at the center of the speaker. Before Chet started using MusicMan amps, as I’ve said, we used different ones. He and I both had a Fender Deluxe in a custom cab modified by Paul Riveria Chet had a Princeton and a Deluxe. After he started using MusicMan he had me sell them because he had too many amps sitting around. Chet's favorite amp was his 1954 Standel. Whenever I recorded at his house I used it too. In the early 50's he used a Fender tweed Deluxe. What Microphones did Chet use? One thing to keep in mind about Chet's tone and sound on his records is the microphones he used with the Standel. He liked an RCA 44 ribbon mic. He also used a Neumann 67, an RCA 77 dx, and an EV RE-15, and I'm sure others that I don't know about. The Neumann 67 may be the best microphone ever made and there are many pictures of him using it during the 60's. It makes a big difference what mike you use on an amp when you record. An EV RE-15, is an excellent mic also. They don't make them anymore but you can find them around in music stores and on ebay. After Scotty Moore gave him a RCA 44 ribbon mike he used that mike all the time. What Kind Of Echo Did Chet Use? Of course there was the Ray Butts EchoSonic. It used a Utah speaker. Chet used the Butts amplifier on some songs, most notably “Mr. Sandman” but he preferred using a reel to reel tape deck with variable speed for recording echo because the EchoSonic could not be adjusted for delay and you could hear the splice as it passed over the heads. In the 50’s Chet used a tape machine for echo. He also used a tape machine on ‘Snowbird’. By “tape machine” I mean a tape recorder, probably a 3 track. Back then he would change the speed on the capstan to vary the delay. In the late 50's there were some tape machines sort of like an Echoplex. I think they were call Echofonic or something like that. Hank Garland had one and so did Harold Bradley. They were portable but they were about twice the size of an Echoplex. Those machines weren't very good. Everybody kept have problems with them. Echo on the road “For echo (“Slap-back” is an old term that describes a tape echo effect now called delay) Chet used different setups over the years. When I started working for Chet in 1975 he was using the first model Echoplex, a grey one, which were very heavy to hand carry as we did all of the time on the road. Then they came out with the black model with no tubes and it was pounds lighter. At that time the company that was making them was running an ad stating Chet used an Echoplex on his recording of ‘Snowbird’ which he did not. Chet got a little upset about that and had his secretary write them a letter and inform them that he didn't use it on ‘Snowbird’. He added that he felt they owed him one of the new models and to stop running the ad, which they did and gave him a new model to boot..
Chet didn't use an Echoplex but very little, if at all, in the studio. The only time I remember was on the ‘Chester and Lester’ album and that was the grey one. I don't know where Chet's Echoplex's went but when the Lexicon 41/42's came out he stopped using the Echoplex. Periods of use are approximate. Chet used various guitars in his recording and performing career but these are what could be considered his most important models. Albums listed with the guitars are not the only albums the guitars are featured on but are good examples of the instrument named. Given to him by Brother Jim (mid 1940’s) Many of his early recordings were made on this instrument. It had a removable DeArmond pickup on it but was usually miked. It can be heard on “Main Street Breakdown” (acoustically) and “Gallopin Guitar” using the DeArmond pickup. When with the Carter Sisters he was using a Gibson L-7 with two P-90 pickups on it. First “good” guitar he was able to afford. Approximately 1948-1950. 1950-1954 Heard on almost all of ‘Stringing Along With Chet Atkins’. It had a Bigsby pickup at the fingerboard and a Gibson P-90 at the bridge. Chet did the actual installation. The neck was broken due to an unfortunate accident immediately prior to Chet going to Gretsch. The top was replaced by John D’Angelico and later restored to it’s electrical state by Paul at Chet’s request. Used until the advent of the ’59. “Finger Style Guitar” and “A Session With Chet Atkins” features this guitar. A very red/orange looking sealed top 6120 with the F-holes drawn in white rather than cut out.. The pickups have 12 poles but their tops look like they have plastic inserts instead of the metal covers used on later production Filter-Trons. These were the prototypes of the Filter Trons. This guitar had two output jacks on it and the pickups were ‘split’ so the treble and bass strings could be sent to different applications. This made for some startlingly unusual recording effects. Chet had given it to brother Lowell’s son Jim who sold it at auction soon after Chet passed. Chet’s primary recording guitar during his Gretsch era. Note: It should not be necessary to point out that the Nashville Classic is a replication of Chet’s ’59 brought about thanks to Paul Yandell’s diligence and close work with the Gretsch company. It was released in 2003. ”…he changed the brass knobs to make the guitar lighter. Chet’s ‘59 came to him with the standard Grover Super Imperial stairstep tuners but didn't like them because they wouldn't stay tight. When the fat “kidney” knobs came along he change them out on his main guitar. He asked Gretsch to start offering two sizes of neck, regular and then the wider one like his. A rumor got started that Chet had switched out the neck on his ’59 at one point. The rumor is false. The neck is as it came from the factory. Chet didn't have a new neck put on it. He told me they just sent him that guitar. I'm sure he requested they make him one with a 25 1/2 scale and they sent him different ones before he found one that had the right sustain which he kept and that was the guitar we now refer to as his favorite ’59 and is the instrument I used as a model when we made the Nashville Classic. That neck swapping rumor has been going around for some time but it never happened. In the Russ Cochran book on Chet's guitars (Me And My Guitars) there is a typo on page 88 where it says it's a’ 61. It is not. The guitar shown on page 89 is his ’59 in its final form and that is the guitar I used as a foundation for the Nashville Classic. I know a lot of players don't like guitars made in Japan and with good reason because there are a lot of bad guitars out there. But there are some that are good, well made guitars, too…Yamaha, D'Angelico and Gretsch for example. I wanted to do the 59' Country Gentleman, serial number 31444 (making it a 1959) for three reasons, first to remember Chet, second, because he cut most of his records with his old one, and third I thought a lot of players (including myself) would like to have one of those if it were available. It's not a perfect guitar and some won't like it, but being made in the USA doesn't mean a great guitar either. I've seen some Gibson Country Gents in music stores that were pretty bad…it just happens. I think when the Nashville Classic gets on the market and everyone plays it they will see it for what it is, a pretty good guitar that has a great sound. After all, how a guitar sounds and plays is what really counts. As far as I know they will be made in Japan, but that doesn't bother me because if they are as good as the one I have it will be a great guitar. Now that the NAMM Show is over and they have shown the guitar I can comment on it. Fred Gretsch had asked me at different times in the past two years to come in with Gretsch as an advisor so about a year ago I suggested to him they reissue the Country Gentleman but do it just like Chet's favorite. Fred told me to go ahead. I went down to the Hall Of Fame three or four times and took measurements of Chet's guitar and we built it. I have had the prototype for about 2 months. After I got it and got it set it up I put my Gibson Country Gentleman in the case because I can truthfully say the Nashville Classic is the best guitar I have ever had. I suggested they go to the old bar bridge that worked on 2 height adjusting screws…maybe they will do that. The prototype I have sounds like a Gretsch. As for getting Chet's sound I never heard anybody get Chet's sound because most of that was in his hands. But having said that, I think you can get close to it. Sound depends, too, on the amp. Chet always used his Standel which had a unique sound. Because we made it like Chet's it’s not like the standard 1959 issue. The new model has Chet's width neck and it has a Supertron pickup in the neck position. The pickups are wound just like Chet's were by TV Jones. Chet didn't like that stock tone switch because it didn't work right. The new guitar is wired like Chet's…no volume control for the front pickup…it has master volume, volume for the back pickup and a tone control. You don't need a front pickup volume control with a master volume control when you are using both pickups because you always turn the back pickup down when you blend them. This new one doesn't have a "block" running down the inside of the top like Gibson has on some of their models but it has a brace under the bridge in between the top and back. It's about 3 inches across the top and bottom and has good sustain down the neck on the bass and treble. When you get into using those blocks the guitars get heavy like the first Gibson Country Gent which had a block of maple down the center and weighed a ton. I think you can get the same effect with "sound posts" underneath the bridge. Chet's old D'Angelico had the greatest sustain and he had a sound post under each side of the bridge. But it's very hard to convince the guitars makers to try new ideas. Chet always wanted Gretsch to do that back then but for some reason they didn't. However that didn't have anything with him leaving them. Chet's neck at the nut is 44.16 mm or 1.7585 inches at the 5th fret it's 48.00mm or 1.89 inches at the 12th fret it’s 52.75mm or 2.0765, the new one is right on these specs. The height of Chet's frets on his 59 Gretsch Country Gentleman is 050. or 1.29mm The prototype of mine when I got it had a height of 095. I couldn't play it in tune so I took them down to 060. It comes standard with the Chet handle and bracket. I know the fixed handle is a problem for some owners. When the Nashville Classic was first done I suggested the a flat handle or a swivel bracket be included with the Nashville Classic so it could be changed because I knew some couldn't use it. The Nashville Classic is a fine guitar so those of you who have it and can't deal with the fixed handle order the flat kind and sell the bracket and handle. Or will be easy to sell the on Ebay or by posting in a forum because those brackets are getting hard to find since Gretsch uses them on the Nashville Classic. I appreciate all the nice comments regarding the Nashville Classic and am gratified by the sales figures. The idea was keep Chet's memory alive and have a great guitar for everyone to own. Every time I pick mine up I think about Chet and how I used to tune his 59' for him…those were really "the good old days". I’d had a 1961 Country Gentleman I bought new but this guitar is a better guitar. Chet used different ones over the years but the Haskell Haile guitars were among his favorites. Chet had two or three Haskel Haile guitars. I was with Chet when he met Mr. Haile. Chet and I used to drive up to his house in KY. The first one Mr. Haile made for Chet was put it in the Smithsonian when Chet died.. He had two more, one with the inlayed pearl on the fretboard and the plain classic which he played and used to record with. Chet and Haskell had a special arrangement and makes for a different spin on the words: "Chet owned". Mr. Haile would build a guitar and give it to Chet. In a few months we would go up to Mr. Haile's house or he and his wife would come down to see Chet and he would have a new guitar with him and if Chet liked it they would just swap them. So this way Chet would have played different ones and traded them back to Mr. Haile. Those guitars would, of course get sold. Did Chet Ever Record Using A 12 String? On Somebody “Stole My Gal” he used a 12 string electric. (Ed. Note: probably a “Stratosphere” guitar, no longer manufactured) That recording came out about the same time as Jimmy Bryant's Stratosphere Boogie on which he used a 12 string. Also on the flip side of Chet’s “Somebody Stole My Gal" was “Shine on Harvest Moon" done on the same guitar. I think he de tuned every other string. It gives a honky-tonk sound the same as the Crazy Otto piano stuff if you remember that. Why did Chet leave Gretsch? Chet left for Gibson around 1980. The biggest reason Chet left was because of the CE classic which he was playing at the time. He was playing the prototype made by Haskell Haille and he couldn't get Gretsch interested in it. He knew it was a great idea so between that and quality control that moved him to go to Gibson. Chet had an idea of making a solid body classical guitar and with a neck provided by Haskell Haille Chet added a board and a Baldwin piano pickup. The experiment worked. Working with Haskell Haille Chet’s concept was made into a prototype model and Chet asked Gretsch to pick up on the idea. They didn’t want to do it. This was right around the time Chet left Gretsch. Gibson jumped on it using Chet’s and Haskell Haille’s ideas, and with the addition of a preamp designed by Ray Butts, developed the CE . “…as I remember it, Kirk Sand came to the CAAS one year and showed his prototype guitars to Chet. Everyone had a fit about his guitars. Chet asked Gibson to build something like Kirk's, so I think Mike Voltz got together with Kirk and Gibson paid Kirk a royalty for each guitar they made. Gibson did their own version of Kirk's guitar. Chet didn't care for the controls being on the top and liked them better on the side. “…Chet played the first Country Gentleman that Gibson made for him longer than any of that series but the first ones weigh a ton. He started having problems with his neck so he had Gibson make him a lighter model and that's when they made all the changes. The first model Gibson Country Gents had the switch down by the controls. I have the very first one, a Christmas present from Chet. When Chet asked Gibson’s Jim Hutchins to build him a lighter model I suggested they move the pickup switch to the upper bout for two reasons. Chet had trouble finding the switch when he was doing a show and also with the switch below the back pickup volume knob it was in the way when you put on a vibrato handle with the stationary bracket so that had to be fixed. At the same time Chet told Hutch to make the F holes the size of a D'Angelico. He didn't like the large F holes. All I ever heard Chet say was that Nato Lima gave him the first one he got. It was the one Nato used on Marie Elena. He had a second one but I never heard him say where he got it. He had truss rods installed in both of them. He gave the second one to Earl Klugh. The third one he has came from Doyle Dykes which is a good sounding one. It is in the Hall of Fame display at present. But as far as I know the one he recorded with all the time is the first one that Nato gave him. When people ask what Chet’s favorite guitar was I usually tell them Chet's favorite was his DelVecchio. After that it was his Gibson nylon. An Octobass Guitar is essentially a guitar with the low e and a strings replaced with fatter strings so one can tune them an octave lower. When played properly a single player can sound like a guitar and a bass guitar at the same time. It's not easy to do this because you have to have a bridge that you can hook the bass string to as they are a lot larger than a guitar string.
. Chet and I had two guitars that I fixed up… one a Country Gentleman with the Schaller “finger” tailpiece and the other was a Tennesseean with a stop tailpiece. You then have to file out large notches in the saddles for the strings and also enlarge the notches in the nut. Then you need to drill out the holes in the tuning keys posts so the bass strings will go through. It's not easy to set the intonations on the two bass strings. Then you have to raise the action pretty high on the bass side for it to work. It's quite an undertaking and if you aren't going to use it very much it's not worth all the time to do it. What kind of Vibrato units did Chet use? The Bigsby “Chet” handle/stationary bracket that Chet used since the 50's is the second one Paul Bigsby made. Merle Travis got the first one. Chet would just take his out of the Bigsby frame and put it in the unit on the guitar that he was using at that time. The actual handle he bent himself and put the tip on it and had it chrome plated. This handle was eventually copied by the Bigsby people for those who wanted one like his. The original bracket and handle is still on the ‘59 Gretsch Country Gentleman that he played for so long. The difference (and advantage) with those stationary brackets is they stay in place and you don't have to keep reaching for the handle Some folks find it is hard to get use to them. How high was Chet’s action? I never measured his action but it was quite high. I use what I consider a high action and his was higher than mine. I would say his action would be uncomfortable for most people. I once measured the distance on Chet's old Country Gentleman from the top of the bars on the bass side to the bottom of the 6th string and found it to be 0.2170inches or 5.52 mm, and the same on the treble side, I didn't measure the back pickup but he had the screws up some. Chet had real strong hands. He told me he started using high action when he first started playing. You get a much better tone and more sustain using a high action. That's one of the reasons Chet got such a great sound. On his classical, if anything, it was higher. When Gibson would send him a new guitar the first thing he did was run the bridge up. On the nylons he would shim them up. What’s the point of having a high action? With higher action when you pick or pluck the string the string is above the frets high enough that you get more sustain and a cleaner note. Low action results in buzzes, fretting out down the neck and all sorts of problems. Its best to have your action as high as you can play comfortably. When he put out a new album he would often be photographed with a current model Gretsch to help the company sell guitars. When record companies did those album covers they might shoot it here in Nashville or New York or California. Gretsch would ship a guitar (a new one) for the cover. … it's almost impossible to see a picture of Chet with a Country Gentleman and think that particular guitar was his. Maybe it is, maybe it isn't. The Chester and Lester album (for example) shows Chet holding a Super Chet but the actual guitar used in the sessions was his ’59. This use of current model guitars on some of his TV appearances were probably for the same reason. I ‘discovered’ Chet when I was about 13 or 14 years old. The first Chet record I ever heard was "I've been Working on the Guitar". I had been playing for a few years but when I heard Chet I knew that was the way to play a guitar. How did Paul get hired by Chet? Chet and I stayed friends down through the years and when I was working with Jerry Reed Chet, of course, produced Jerry's records. Sometimes I would record with Chet as a sideman. Jerry got to making movies and really did not need a band so I left Jerry and went over and asked Chet if he needed a guitar player. He said, “Let me call Jerry and see if he minds me hiring you.” Of course, Jerry said, "Why no, not at all!" So that's how I started with Chet and it lasted 24 years. And I can tell you, if I had it to do over again, I would do it exactly the same. Working for Chet was a once in a lifetime dream, and I have to give credit to Jerry Reed too because if I had not worked for Jerry and learned so much from him I don't think I would have been qualified to work for Chet. What was Paul’s early recording setup? When I recorded with the Louvin’s back then studios were different…no effects, no reverb, nothing. All I had was a Gretsch 6120 and a Fender Pro amp with a 15” speaker in it, miked with a RCA-44. The mike's back then were ribbon mikes and you got a big, fat, sound with them. The stuff they do today is too clean. The warmth is gone. With the Louvin’s in 1955 just days after getting hired. Worked with them from 1955 to 1959. Went into the army from 1960-1962.Used a 6120 playing with them. When I got out of the army Little Jimmy Dickens helped me get a job with Kitty Wells. That was in 1962 to 1975. We stayed on the road 200 days a year. Around 1970 to 1975 Used Fender guitars playing with Jerry. Jerry and I had known each other since my Louvin Brothers. days. When Jerry moved to town at that time there were two or three local TV shows that had him as a guest . Chet started using him on sessions so he could make a living. After Chet recorded "Down Home" Jerry's name became a hot item in Nashville. Chet and Jerry went to the NAMM show in Chicago and Jerry saw the Baldwin guitar which he latched onto. That really sent him on his way because that's when Jerry got his sound. I did about four or five albums with him. I did the clawing on "Jerry's Breakdown" and "Lord Mister Ford" and others I can't remember. It was a trip to record with Jerry. He didn't want anyone to write a number chart, just learn the song. He had the drums sit out in the middle of the floor, not in the drum booth. Jerry was one of the best I ever saw in the studio. He played better when the red light went on than when it was off. He started off just playing clubs and when he came out of Atlanta with all that soul, I, like everyone else, knew Jerry Reed was on his way to being a big star. What was playin on The Opry at the Ryman like? I was thinking back one day, while I was taking my morning walk, to when I came to Nashville in the spring of 1955 and started playing on the Opry. I had just started working with the Louvin Bros. I was 20 years old and everything was exciting and fresh and I felt like I had realized my dream of coming to Nashville. Playing the Opry in those days was interesting from a guitarist’s standpoint. WSM’s Ryman Auditorium had a box connected to the floor it had I think four inputs. Right above it, about eight feet high, hanging down, was the monitor speaker. So when you played you plugged in the box and then stood under the speaker. As I remember it really sounded good. There was an engineer in the booth over at stage left listening to WSM over the radio to hear how the mix was. It would be a lot better today if they still did it that way. All the great stars were young and in their prime then. Hank Garland was playing the Opry with different artists as was Grady Martin. Chet was on every Friday and Saturday night, it seemed almost every week or two Chet would be playing a new Gretsch guitar. I remember one Saturday night Hank Garland showing Odell Martin and myself how to play Sugarfoot Rag. At that time Chet, Odell Martin, Joe Edwards, Jackie Phelps and myself were the only ones using a thumbpick on the Opry, I remember taking a lot of kidding about using one. Billy Byrd use to give me the business about it and it really got next to me because I thought I was doing right. Anyway, as I got older, I realized what they thought didn't make much difference in the long run because now I think there are as many players using thumbpicks as straight picks. Chet told me once he didn't like to play the Opry much because while he was playing some guy would be down in front of the stage yelling about selling popcorn. They have a million dollar sound system at the Opry house now and it sounds like crap. The sound people know nothing about mixing. The TV cueing is no better. Many times I've seen on the TV portion the fiddle player would take a break on a song and the camera would be on the steel player. When I came to Nashville the Opry was a big deal and an artist had to be somebody to join. At one time was really a great thing. Nowadays it's not as important as it once was.As time went along they started putting people on the Opry who had never even had a hit record and in a sense that dumbed it down. About 1960 or so a few of the musicians who are now the staff band on the Opry talked the Opry people into using a staff band. I think that was the worse thing that ever happened to the Opry! Other players like myself and Hank and Grady had to stop working it. It put a lot of people out of work and made the show boring to have the same licks and musicians every weekend. Some of them are good musicians but once there was a drummer in the staff band who got his brother on there playing rhythm who was the worse you ever saw. Nowdays they have a young guy running the Opry who knows nothing about show business. There's hardly any humor; it's all singers and the TV show is a showcase for unknowns. The artists sing the same songs every Friday and Saturday night. I very seldom ever listen to it anymore but that's the world we live in. It's like the movies they make today. Anyway, that's the way it was… I just thought I would share some of my memories of a very special time. Odell Martin and I met when we both were in high school. We lived about fifty miles apart up in Kentucky. We became great friends, almost like brothers. He and I played many a night at some person’s house and had a great time. I came to Nashville first and started with the Louvins. Odell was still in school. After I was with the Louvins about a year Bill Carlisle was looking for a guitar player and I recommend Odell. Odell got the job and we shared an aparment for about four years until I went into the army. Odell was a great person and everyone who knew him loved him. He was one of the best fingerpickers around and if he were alive today he would be a hot topic on the ChetBoard and at any gathering of finger style guitarists. He didn't record much but there are some tapes of him playing floating around. I think Eddie Penningtion did a cassette a few years ago of Odell's live playing. In 1985 Odell died in a car wreck early one morning a few miles from his home in Todd County Kentucky. It almost broke my heart…it was a great waste. What kind of guitar did you use in a recording session? It all depended on the session. When I was doing studio work I would carry a Martin D-28, an electric guitar and amp, an effects rack, sometimes a classic guitar. In a session where you would do four songs sometimes they would all be different styles. When I recorded with Chet he would tell me before hand what I was going to do and I would only take that guitar he had amps so I didn't have to take one. Some of my fondest memories of when I worked with Chet are when we recorded. I was young and playing pretty good and I was always excited when we got to the studio with the other musicians. When Chet ran down a tune he wouldn't tell you the chords or what he wanted you to do; it was up to you to learn them and figure out your part then if he didn't like what you were doing he would say something about it. ‘The Peaver’ was a guitar I built for Chet to record with. I had made myself one and he liked it. He had a Peavey T-60 so I took the body and put a wide type Strat neck on it. I then put 2 EMG pickups in it. He used it quite a bit. “ Sunrise” was one tune, “Laughing at Life” was another. It wasn't very pretty as guitars go, but sounded great. When I started working with Chet I was playing Peavey guitars but I never heard Chet say anything about going with Peavey I talked Gibson into building a similar one to the ‘Peaver’ called "Sunrise" they built a few but they didn't make it. We did the same thing every time we went out to play a date. Get on a plane, get off the plane, check in the hotel, go do a sound check, eat dinner, and go do the show, go to bed, and catch a plane back to Nashville… mostly that was it. We had different musicians during the years. I was eventually the band leader. When I started working with Chet he didn't have a band. By that I mean he didn't have the same four people that went out all the time. He had a drummer who lived in Atlanta and used different bass players. After a while he told me I was the band leader and it became up to me to round up a band to go on the road. When we changed someone in the band most of the time I would tell the person that Chet was going to make a change but sometimes he would do it. Over the years we used different bass players and drummers. Sometimes we’d add a piano player. The last ten or so years we had the same band members except Chet stopped using a keyboard and hired guitarist Pat Bergeson. That was the best band we ever had. As far as I know the artist's here in Nashville pay by the day instead of signing a contract. Chet paid his musicians himself, a certain amount per day. Every day we played a show we got paid and when we were off the road he would pay us a smaller amount to cover our expenses. He paid our hotel and transportation, airlines or whatever. We paid for our food. What was Life on the road like? Here’s an idea of how hard road life could be I saw (guitarist and friend) Odell (Martin) every now and then when he was working with Donna Fargo and it was a tough job. He was playing one or two shows and then driving the bus to the next date. When Odell and I worked with Kitty Wells he and I did the same thing and I tell you folks it's rough to play two shows and get behind the wheel of a bus at midnight and drive until daylight. I did it many times. When I started with Jerry Reed and found out he flew everywhere it was like heaven. No I don't miss it at all. I was on the road for about fifty years and that is enough. bad food and Motels and Hotels and crying babies on the planes. I thought everyone might be interested in knowing how a normal day on the road went. If we were flying to a date, which we almost always did, we would arrive at the airport about forty five minutes before flight time, Chet would drive his Mercedes or his SUV and have someone go park it for him and he would go to the gate. We checked all our gear except Chet's Classic which Randy Hauser carried on the plane an put in the overhead. His fiddle also went in the over head, I always carried my Gibson Country Gentleman in a bag on the plane. Chet always sat in First Class and was always reading something, a new book or the newspaper. When we got to where we were going our road manager always had someone there to take Chet to the hotel we were staying at sometimes I would go with Chet to be sure he got checked in. The other guys came with the gear and the road manager and Randy went on to the gig to set up. About 3:30 Chet and the band would go to the gig to have a sound check which took about 45 minutes we then went back to the hotel. The shows were almost always at 8:00 pm we would get there about 7:15. Chet had in his contract that there was to be some soup, cheese and fruit and coffee and soft drinks back stage for us to have before and after the show. At about 5 minutes to 8 the road manager would go out on stage and announce that no taping was allowed. Then at 8:00 Chet would walk out, plug in his guitar, check his delay and amp and start playing. He would do about three tunes and then he would bring me out and we did about three more. At that point he brought the rest of the band out and we would do about 45 minutes. After a thirty minute intermission we would go back out and do about an hour. After the show Chet, after resting for about 15 minutes, would give autographs. During that time the band would be loading up the gear. We would then go back to the hotel and maybe go to the lounge, relax and have a beer. The next morning we would go to the airport and go back home. That was the way we did it 98% of the time. Chet and I never loosened our strings on our guitars when we traveled. I really don't think that makes any difference. About the only thing that happens is that your guitar gets cold from flying so high. We had special travel cases made by a fellow here in Nashville they are about 8 inches thick and have heavy foam linings. I guess we flew a million miles and I only had one incident. On the other hand our amps keep getting beat up all the time. A Country Gentleman is too big to get in the overhang. Some airlines wouldn't even let us take Chet's fiddle on board. Some people claim Chet paid for an additional passenger and put the guitar in the seat next to him. According to the story, he was tired of them being stolen. Well, he never did that while I was with him and I worked for him for 24 years. First of all, it cost too much and Chet doesn't like to waste money. Secondly there wasn't any need to because we had travel cases that could handle the airlines and also Randy Hauser our drummer hand carried Chet's nylon string on the plane and put it in the overhead. When I first started working with Chet, in 1975 he was playing the Gretsch ’59 Country Gentleman. A number of times when he or I would open his case at the gig the bridge would have fallen over. We would just push it back up and Chet would set the intonation by ear. Later we had those heavy cases made for them so the guitars rode well. Pinning the bridges helped immensely. The last ten years or so I had a gig bag for my guitar and I carried it on the plane. I used a Reunion Blues gig bag. We carried our own amps and we had special cases made for them but every time we would go to CA. the planes would bust a speaker or the transformer in Chet’s amp would come loose. Many times I had to put his or my amps back together so we could do the show. What kind of picks did Chet use? Over the years Chet used different thumb picks. At one time Chet used a certain blue pick but I don't think it's a Herco. I used them some. For a while he used those Herco picks that where made years ago. We used them and I still do sometimes. .
At the time I worked for Jerry Reed he was using those small narrow ones that Lenny Breau used. After a while he change to a medium pick. Back in the 70's there were really good picks around. Then he used the Herco pick for a while. A friend of ours, Jason Lambert, who ran a music store in NC a few years ago, gave Chet and I some great picks, some of those 1970's picks and he used them from then on. What Chet would do is round the tips off where they weren't so pointed, a more oval shape. He got a bigger note and could play single notes that way. But they were the normal thickness. Did Chet play single lead lines with thumbpick or fingers? Another thing about that song, the intro on that record wasn't played by Don Gibson but Velma Smith who Chet used a lot. She was a real good rhythm player. Most unusual re-tuning Chet used? Chet told me once that back in the 50's he tuned his guitar to F and sometimes to F# instead of E, he said he liked the sound and it made him sound different, so that's the reason some of his records are in odd keys. He gets a great sound on "A Little Bit Of Blues" but for that he is tuned down a whole step. Chet and I flew almost everywhere we went. When we got to a date and opened our guitar cases the bridges would be everywhere. When Chet was playing his Gretsch Country Gentleman the airlines would knock the bridge completely off the guitar. Many times I've seen him put it back on so we could rehearse. So we pinned them down and that stopped that. Bridge pinning is a somewhat controversial subject among guitarists but I think you should do it or have it done. Chet and I have done it for years. It keeps the bridge from shifting around. I use what they call brads, a small nail that has a small head. My friend, Sonny Thomas, uses a screw like the ones that hold the pickup frames. In either case, you do it the same way. I set the intonation and then take masking tape and tape each end of the base of the bridge. Then loosen the strings so you can take off the top of the bridge leaving the base taped down. Drill a small hole for each of the brads (or screws) on the inside of the adjustment screws on each side. I put a small drop of super glue on the brads head to hold them in (be careful not to get any glue on your guitar) then put the top of the bridge back on, tune up the strings and remove the tape and that's it. You'll never have any more trouble. For those that worry about changing string gauges after pinning the bridge, when you set the intonation you put the first string saddle in the middle of the adjustment slot (on the Schaller bridge that Gibson uses there is almost 1/2 inch travel). Not many people will change up to much greater size string I have gone to a 50 on the 6th and a 48 on the 5th without any more adjustment on my guitar. On Chet’s ’59 Gretsch, when I started working for him, he had the stock Gretsch bar bridge and he never changed it. I think he wanted to keep it original looking. When it came to working out arrangements and new tunes as I remember it didn't take too long. Chet was really fast at working up a new tune. He always had trouble sleeping. He would wake up sometimes at 4 am and practice. Chet had such a command of his music and his instrument it didn't take long to work up new stuff. Whenever I would record with him he knew his part when we went to do it. He was amazing. Chet played better off the top of his head than most people did rehearsing their part. Chet and I didn't practice very much. I know some people find that hard to believe but when we learned a new tune most of the time it was out on the road when we didn't have anything to do. Chet would already know how he wanted to play a piece and then I would learn my part. When I got my part and we would perform it on stage, Chet would play it different but it would fit with what I was doing. He very seldom played a piece the same because he would think of something better to play. As far as new tunes, if he wrote a new one it didn't take too long to get it down. One of the first things he would do was play it for me because it’s always good to play a new tune for another musician. It helps to get over being nervous. Then when we went to do a show he would perform it on stage. After playing it for a month or two he would record it. Did Chet take special precautions for his guitars while traveling? With Chet it depended on what guitar he was using. If it was a classic (non electric) he would just put a mike in front of it. If it was an electric (Country Gentleman) he would plug into his Standel and use a mike on the amp. After Scotty Moore gave him a RCA 44 ribbon mike he used that mike all the time. Back in the 60's the engineer mixed the song or tune as it was recorded which meant everyone had to almost play perfect. I always wondered and I never thought to ask Chet (and I remember when they did it) was why did they shut down Studio B. It was the best studio in town. Chet did most of his things at home, but back in the 70's he recorded at Studio A at RCA. Some times he would make the basic track and then overdub his part. To do this he would play the tune in the studio with the musicians and then if he wanted to he would redo his part. A lot of those album credits you read where they list the RCA Studio as the recording site were really ones Chet did the rhythm section at the studio and then doing his part at home. The people writing those texts wouldn't have known that. Before a concert he would spend some time warming up after about 20 minutes I would go over to his dressing room and we would play some or just talk awhile. After a show, most of the time, Chet rested a little while after he came off stage. As he got older he took more time before he saw anyone. Have There Been Any Major Changes In The Nashville Classic? The Chester and Lester and Guitar Monsters albums were done at RCA’s Studio A. Those are sessions I remember very well. I was either in the control room or out in the studio at the time and all the tunes in that album where done at those sessions. I played bass on one or two of them. Chet and Les would work out the intro and ending and then play the tune about once and then record it. On the Guitar Monsters album I played rhythm. Chet played his old 59 Gretsch Country Gentleman and used a large Pignose amp. He and I had a couple of those we used for about a year. It was about 100 watts and had a 12" speaker but they had problems and kept going out. They sounded great but had problems in the power supply so we stopped using them. Paul Rivera had given them to us. Chet was using his old gray Echoplex on that session. Les was wilder than a March Hare. It was a contest and I really had a ball being there. On Avalon I sat in front of Chet on the floor and adjusted the old Echoplex that he used back then. You can hear him give me instructions. Les was playing a white Les Paul with low impedance pickups and all those switches on it. If I remember correctly, Les went direct into the board and had a small Boss DD2 delay. It sounds to me like Les was trying to outdo Chet. I thought so and so did Randy Goodrum who was playing piano at the session. Chet was amazing on that session. I don't think he fixed anything later. Everything was off the top of his head. I think it was some of his finest playing ever and his tone was superb. They did all those Chester and Lester cuts in two sessions, a 10 am and a 2 pm session. The Guitar Monsters album wasn't quite as good in my opinion. Les had a bad cold and didn't feel like playing. I don’t think the tunes were as good either. When Chet and Les were doing the Guitar Monsters album I was playing rhythm in between songs there was a lull and I said to Les " Say Les, play the intro to How High the Moon" Les replied " I only play that when I'm getting paid". I thought to my self well I guess he told me. Chet always said Les made great records and he thought How High the Moon was the greatest record ever made. I would like to point out all of Les's big hits had Mary Ford singing on them. She was one of the greatest female singers ever and I don't think Les would have sold 60 million records without her because people buy very few instrumentals. But even at that, those where great days and it was exciting to be a part of them. Freddie is a young guy in Russia who has a website that provides streaming audio of many of Chet’s albums. Where Can I Find Tabs Of Chet's Songs? Where Can I Buy Chet's Books And Records? Online searches and pricing via Ebay and other popular retail sites can turn up items also. What Happened To Chet’s Guitar Collection? The Hall of Fame is going to keep his guitar collection for a while and then they will be transferred to a more secure place. It takes a lot of room to store all those guitars. Chet left all his guitars in a trust which means they can't be sold or something like that. What's the zero fret on the Country Gent all about? Chet saw the concept on one of Django Reinhardt’s guitars and like the idea. Other features Chet designed into his Gretsch signature line of course included the addition of the Bigsby. In 1955 he was using a sealed top 6120, an idea that was likely at his request since he was looking for ways to get more sustain out of a guitar. Ray Butts designed the Filter Tron pickups which Chet embraced since he didn’t like the stock DeArmonds Gretsch was using at the time. In 1959 the zero fret he suggested was added and the wider neck was an option at his suggestion at that time also. The double bar “Super Tron” pickup didn’t go into producion Gretsch’s until 1962 or so although Chet used the prototype for years. Did Chet Have A Favorite Steel String Electric Guitar? He played his ‘59 for 30 years so what does that say? I don't think Chet liked any guitar 100%. He found then all wanting, but if anyone doesn't think his Gretsch guitars sounded better than the Gibsons just listen to his records and hear for yourself. I remember one time, after he went with Gibson, saying to him something about recording with the old Country Gentleman and he didn't want to. I think he felt it was dishonest to use it after going with Gibson.
" You know Chet, that Gibson Country Gentleman doesn't have as good of tone as your old Gretsch Country Gentleman." He replied "Well, don't tell anybody." I think he knew but it was too late to do anything about it. Even later on, When Chet was recording the "Almost Alone" CD, I went out one day to play on the tune Maybelle. We got to talking and he was upset with Gibson about something that day and he made the remark" If they aren't careful I'll start playing my D'Angelico again." I don't think he would ever have done it and besides, I couldn't see him flying with that guitar but I was surprised to hear him say that. We never talked about it much but he knew that he had lost a lot of tone by switching guitar companies. That old ‘59 had the tone! I have a tape of him playing in Knoxville before I started with him and he was getting the same tone live as he got on his records. Chet could make that ‘59 sing. Does Paul Have Any General Views About Playing? I'll tell you a few things that I've learned over the years which may or may not be correct but this is what I think. To sound the best you can you need first a good sounding guitar, setup right, so you can play your best. Then have a good sounding amp… not a lot of power. The powerful ones never have any tone, a 50 watt one is just fine. Then have a good reverb. Most amps have terrible reverbs. A good outboard digital one is the best but even then don't overuse it. For echo a good digital delay like the Boss DD-3 is good. I have one of those I used to use on the road. Chet used delay to get more sustain out of his guitar. The trouble with effects is you get use to using them and then you can't play without them. Another thing… don't try to blow everybody's ears out playing loud. Playing loud isn't anything to brag about. Try to play in the groove! Pay attention to your thumb. Your thumb is the most important part of it. If you all want to hear someone that had a great feel in his thumb get something of Odell Martin's. He was one of the greatest and he was like a brother to me. What I mean to say is that some players really don't pay attention to their thumb. They don't play in the groove and make their thumb swing. Chet and Merle, of course, had it, Odell Martin had a great thumb, and Eddie Pennington has a good feel. There are a few players around that play in the groove but it seems that playing fast is more important to some than playing with feeling. I noticed some will talk about Clinics. I think Ray Cummings does it right. Some clinics are just another concert at double the price. You can't learn much because there is so much played. If you remember one or two things you’re lucky. A person would much better off to spend $25.00 and buy one of Chet's tapes or CD’s and watch it. Someone asked Chet one time how you get to be a good guitar player his answer was " Get your guitar and go to your bedroom and practice 10 hours a day". That Handle On The NC Is Not Quite Where I Need It To Be. What's The Recommended Way To Bend It? You might need to bend it to suit your own hand and style because for some reason they aren't bending the handles far enough . What I use is an old ratchet wrench I have that has a hole in the end of the handle you use to hang it up with. If you know someone who has a lot of tools they may have something similar you could borrow. The hole needs to just fit that ¼” rod and allow you some leverage so you can bend the metal. Another thing you can use is a piece of oak plank cut about 2" wide and 7 or 8" long. It needs to be about 1 inch thick. Drill a hole in one end a little bigger than the handle and you can bend it with that. What happened was when Gretsch bought Bigsby the operations were moved to Korea and they started bending them wrong right from the start. I wasn't connected with Gretsch at that time so I guess no one noticed. The handle is bent the same as the old ones except the knob end. It's not parallel to the first string. I worked to get that changed since the Nashville Classic came into being. They finally got it right in early 2005. One thing about the new handles I like better than the old ones is that the knob unscrews and you can bend the end up a little which is the way I perferred. In January of 2004 I decided to make myself a vibrato handle for my fixed bracket. I went over and got some 1/4 welding rod. I already had some 1/2 brass rod so I cut a 7 1/2" piece and drilled a hole in my desk top which is over an inch think and bent the handle. I then took the handle and a piece of the 1/2" brass rod over to a machinist friend of mine and had him to put the knob on it. It's great! I sent it to the platers and had it chrome plated. I could have had it gold plated but I like the chrome better. Any of you can do the same thing and make them as long or as short as you want. I just thought I would pass it along. Does Paul have any CD's I can buy? Paul has a website that lists his earlier CD releases and ordering information. Are Any Biographies Of Chet Available? And What Is MAMG? There was also a book called “Country Gentleman” ghosted by Bill Neely. “Country Gentleman” was released in 1974 just after Chet’s first battle with Cancer. “MAMG” was released in 2001 just prior to his passing. A thin blue volume called simply “Chet Atkins” was available in the sixties but it, too, is out of print. Patience and diligence will usually turn up the out of print volumes if one has access to the internet. There's A 12-string Country Gentleman On The Cover Of Chet Atkins Picks On the Beatles. Did Chet Actually Use This On Any Recordings? Apparently not. The only known examples of Chet recording with a twelve string were Shine On Harvest Moon and Somebody Stole My Gal using a Stratosphere guitar sometime in the fifties. “Country Gentleman” is a copyrighted name/title and at the time of the creation of the Nashville Classic “Country Gentleman” was licensed exclusively to Gibson. By the way, the name “Nashville Classic” was coined by Paul Yandell. How Long Was Chet An A/R man for RCA in Nashville?/What Does An A/R Man Do? An “A&R Man” is in charge of “Artists and Repritoire” which means they match up the material to the artist and often do the actual producing of the material. In short making the recording session work. Chet’s first “A&R” bit was in the mid fifties taking Don Gibson and releasing “Oh Lonesome Me” and “I Can’t Stop Loving You” at a time when other labels including RCA were reluctant to use him. The success of that record made Chet go from a session leader to “A&R” man and you tend to keep the job and title until you quit or your matchups no longer produce hits. Chet stopped doing that because he felt it took him away from playin guitar and left RCA in the early eighties. What's with all those tuning forks and pop-up mutes and such on the Chet Atkins models that Gretsch used to make? Those gimmicks were largely the idea of Jimmie Webster, an influential advisor for Gretsch. He was a believer in the idea that change sold guitars and installed things like the pop up mutes, double cutaways etc. without consulting Chet. Chet didn’t care for many of those things but had little control over them. What Are Those Two Holes In The Top Of Chet’s ’59? There are a couple of odd holes in the top of that guitar near the bridge and vibrato unit on his ‘59 but I never did ask him about those holes that I remember. I may have but if I did I've forgotten. What Amplifier Is Paul Currently Using? I use two amps, the Delta Blues and a Music Man RD-50. That small Peavy Classic 30 amp is a nice one also. It has a 12" speaker and it is a tube amp. I know there are others out there but I have found any amp with less than a 12" speaker sounds mighty thin. I did a bit of research on this but do not consider myself an authority on the subject nor is this the ‘last word’ in nail care.. However I have used my nails in playing guitar for over fifty years. These are only suggestions and you are strongly urged to do your own research. Addressing the problem of how to keep ones nails in condition for steel string playing and what to do if they break. There are no sure cures or best fixes. Even online sites do not agree as to nail treatment but they do tend to agree on filing and conditioning to some degree. One thing certain is that keeping ‘guitarist’s nails’ requires attention and maintenance. I googled ‘guitar nails’ and found several sites and most of them give chattier variations on what Muriel said. Another good topic to google is ‘nail care’ and see what’s out there. 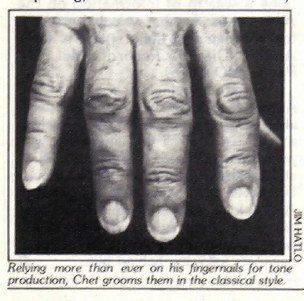 This varies due to individual tastes but a little looking at pictures of Chet’s right hand is illuminating. The way he shapes the edge that actually strikes the string is most important. Lenny Breau (and most Flamenco players) tend to have longer nails on the right hand than other guitarists. Most (including Chet) tend to keep the nail in the classical style just long enough to cleat the tips of the fingertip so that the flesh of the tip contacts the string at the same time as the nail. Dealing with breaks and cracks. Several methods of patching were suggested from full jacket acrylic to temporary fake nails available at cosmetic counters. Several approaches to Krazy Glue and various materials, everything from silk to ping pong balls are pointed out. Keep the edges smooth. There are all kinds of files and board available to shape and condition nails but one of the best kinds of shaping tools I have ever seen is easily available in cosmetic departments of most stores. It looks like a regular emery board but has three surfaces, a short, coarse section and a conditioning pad on one side and a long strip of extremely fine emery on the other. I use this to polish the edge of my nails so they shine like glass. (Don’t worry boys, no one will notice this unless they actually take your fingers and scrutinize the edges) This lessens the likelihood of snags which can develop splits. Some folks take gelatin regularly. Some folks like acrylic nails. This works but can cause problems. A consultation with a professional manicurist is worth your time. As Muriel points out, inattention in this area can cause problems. Krazy Glue and ping pong ball plastic cut to fit was used by Chet from time to time. There are creams you can use that allegedly are based on hoof treatment ointments that claim strengthening powers. Using any potions are to be approached carefully to gauge the actual effect on your nails to see if it addresses your particular situation of does as affected. Some are benign but some (particularly those that contain formaldehyde) have an adverse effect on the cuticles. Read the ingredients carefully. A visit to a well stocked cosmetic department is worth a visit. Here is a typical “nail care” regimen written for women but can be easily adapted for guitarists. Just don’t use nail polish and skip any references to nail polish.. The rest of the material actually makes a lot of sense but having said that, not all sites agree on things like treatment of cuticles, etc..
1. Remove any old nail polish. To remove the old polish, first moisten cotton with nail polish remover and press over the nail for a few seconds to soften the polish. Then with a firm movement, bring the cotton from the base of the nail to the tip. Repeat this process until all of the polish is gone. 2. Shape the nail, using a file or emery board. File each nail tip from corner to center; do not file in a see-saw motion with the emery board because doing so can cause ridges in the nail and nail splitting. 3. Soak the hands in warm, soapy water for a few minutes to remove dirt. Clean under free edge of nail with orangewood stick. 4. The cuticle is the skin that grows from the finger onto the base of the nail (nail root). We recommend that the cuticle not be pushed back. Leaving the cuticle intact helps to prevent infection of the nail growing tissue. 5. Now apply clear nail polish. There is no reason to waste money on several different kinds of clear polishes such as a ridgefiller, base coat, top coat or nail strengthener. They all do about the same job. After the clear polish dries, apply a color polish of your choice if you wish. Let dry. You may then reapply the clear polish as a top coat. This will help strengthen the nail and prevent chipping of the nail polish. 6. Finally, apply a moisturizing cream or lotion to the hands and cuticles. This will help prevent splitting of the nails. One of the Chetboard posters claimed washing dishes by hand a couple times a week seemed to be helpful to keeping his nails strong. Some sites disapprove of this kind of treatment but on a personal level, being a bachelor, my nails are in pretty good shape and I wash my dishes by hand daily. About once or twice a week I apply a cream allegedly made from a veterinarian’s formula for treating horse hooves. I suppose this would come under the heading of ‘moisturizing” cream. It seems to help and seems to visibly improve the surface of my nails with no gloss or sheen. Some sites advocate pushing the cuticle back. Personally I do not do this. If you feel inclination or the need to apply one of the “nail strengtheners” I would suggest you do so and after it dries touch it up with a very fine emery board just enough to knock off the sheen. The biggest drawback I personally see in using acrylics and enamels is the effect of chemicals on the nails since you have to use a solvent from time to time to remove any material or application of lacquer you apply. Some guitarists have excellent luck with acrylic nails. ¨ A good time to do your manicure is after you have taken a shower, bath or after washing the dishes. This is because these activities remove the dirt from under the nail. ¨ Nail polish thinner can be used to thin out nail polish that has become too thick. Keep the polish in the refrigerator to make it last longer. ¨ Try not to use nail polish remover more than once a week. Nail polish remover causes the nails to dry out. Dry nails crack and split more easily than nails that are well hydrated (well-moisturized). ¨ A top coat or sealer is a liquid that is applied over the nail polish. Any clear nail polish can be used as a top coat or sealer. This will minimize chipping or cracking of the nail. On natural nails, a clear coat can be used every day for seven days to give the nail protection and keep the moisture in. ¨ After washing your hands, apply a cream or lotion. Hands and nails tend to get dried out from soaps and cleansers. You should try to keep your hands and cuticles well lubricated, with a moisturizer such as Aquaphor, Moisturel, Vaseline. You should use an oil or moisturizer at bedtime every night. ¨ Sometimes nail polish, dirt and bacteria can stain the nails. This can be removed by using a Q-tip or an orangewood stick with a cotton tip. Soak the cotton in 10 parts water mixed with 1 part bleach, then rub the nail where the stain is. This will remove most stains from the nails. Scrub under the nails with a nail brush or toothbrush with soap or bleach solution to remove stains under the nails. ¨ A vitamin called biotin makes nails stronger in animals. Some studies suggest that it may help strengthen human nails. Biotin is available at health food stores.